Such a sweet looking guy. We are sad for your loss. I know how rough this is on everyone. May you find comfort in knowing your dear one is around you in Spirit. Sami was greatly loved at Kitty Korner and is greatly missed. We're sorry your time came to leave, Sami. Hugs to your mom! Our mom bean has leaky eyes right now She says thank you from the bottom of her heart that you have memorialized our Sami here. 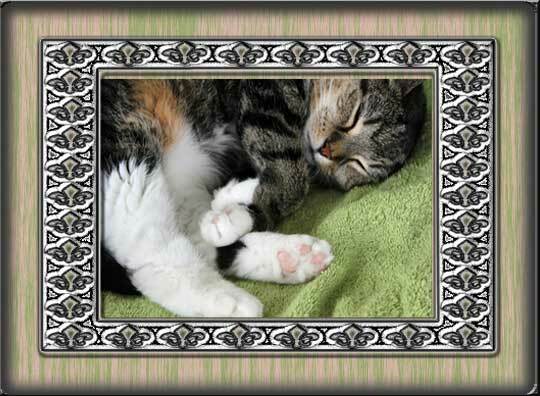 She was a beautiful girl, a furstastic fursib and Mom's favorite nickname for her, Squirt. Thank you to all who have come by our blog to leave your condolences and sympathy. We know you all understand the sadness we feel right now. Purrs to all who are hurting right now. Oh, Sami, we sure do miss you. Fly free, sweet one, and know you are greatly loved and missed, especially by your beloved family. Hugs and purrs to them.